Scroll down for a LIVE Tee Time Scheduler! 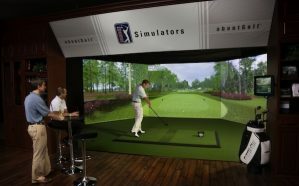 New to Peoria - Indoor Golf Simulator! UPSTAIRS at The Country Club BBQ! Available booking times will show based on the date & hours selected in the scheduler. If you do not see a time available please either select a new date or adjust the hours you are requesting. Thank you for scheduling your booking. We will see you soon! When you arrive, please check in at the main bar with a credit card to start your golfing experience! Sorry, your selected time slot(s) booked recently. click here to Try again! Bring friends and split the cost per hour! Call 309-424-6802 for catering, lessons, club fitting, specials, and more!